Self-Certify – What does this mean? …and why would anyone want it? Certification, or Certifying, is a process that reviews the state of something, or some things, or some set of action(s). Most often it is the processes and tools that create, assemble or completes something that need to be examined in a particular way for a particular purpose. The purpose is to be able to say whether these items or processes meet the standards that someone says are “the standards to meet.” The standard might be set by the boss, or the owner, or it might be set by a Standards organisation. For example: For example, my company makes ceiling tiles. I have 3 kinds: Super ceiling tiles that will last for decades or Super Cheap ones that will last for 2 seasons and need replacing, and I make a version Not Super in between. They all need to be go through a process to insure a particular degree of fire resistance, which is specified by a national fire standards organization. I could rely upon my reputation and prices to make my sales. But I want to get an order from a company that requires that I certify my production quality. They want to know what I do to ensure that all the tiles they buy from us meet the fire standards and will last for the 10 years that I promise. My team decides to make a list that all manufacturing people have to follow that specifies what equipment and parts to use, and how the people using the equipment will be trained and how often the equipment will be cleaned and tested. It will also check how the tiles are packaged and sent so they can be received properly. If my staff completes these steps on the forms, and validates that the equipment is working right, and everyone is trained correctly, and the product is great, then they sign the form – and we are self-certified. At this point the customer might be satisfied. Or they might ask that someone who is an expert come in every month and check that these things are being done. There is an organization named the ISO which has made standards of many things. One of them is the management technique of Quality Management. It is called ISO 9000/9001. It covers many of these steps, plus many more. So what? : Some cinemas have auditoriums that are called Premium. If I go to that theater, I expect the sound to be correct in all speakers without rattles. I expect that the screen is clean and that the light levels are set correctly. I want to see well into the shadows, and I want to hear bells ring clearly. In the movie business, the Standards organisation is The Society of Motion Picture and Television Engineers, which is called SMPTE (pronounced Sim Tee.) The same ISO mentioned above works with SMPTE and other groups to make standards that can apply around the world. If I own a cinema, I may want to follow the SMPTE standards perfectly, but to be ISO certified I also have to make certain that my accounting system and trash system and everything in the cinema is up to a certain standard. People probably don’t want to pay for all of the effort it would take to do all this. But, Self-Certifying to my clients could have some benefit. There is an important difference between standards and recommended practices. Standards make certain that equipment and software works together. But specifications about things like the light level expected in a cinema theatre is detailed in a document called a Recommended Practice. The recommended light level can be higher or lower by 10%. Here is the important part: Some cinemas will take advantage of that 20% variation. Some cinemas will say, we want to stay within 10% …some might say I want to check every day and be within 2%. This is an agreement between the cinema owner and the customer. If I am going to pay $25 for a ticket to a movie I might expect more than if I spend $7 for a movie. Part Two: Quality, and how do we get it to the customers before they notice problems? In the old days there were several trained technicians in every cinema facility. They were called projectionists. Some were very skilled in sound and picture techniques. Some were apprentices. But if you had ever seen two of these people respond to a blown bulb in a projector, with safety procedures and speed, you would know that they were not just lucky people with simple jobs. In the Grand Scheme of Things, Cinema Test Tools wants to deliver tools that help you Self-Certify the routines and processes which will help ensure that the Director’s Intent is getting portrayed on the screen …and that they are accomplished constantly and consistently. We do this for the Producer and Director – who had the first vision – and for your customer – who has the last vision. Question: How do we create tools that will ensure the director’s intent and the owner’s desire to deliver at the quality level promised? In the cinema there is, 1) the facility itself, 2) the equipment that makes it possible to see and hear a movie, 3) the systems to a) keep that those systems working well and b) to keep everyone safe 4) the employees who deal with the audience and with the equipment. Answer is to build in some systematic checks on the equipment and systems that we are responsible for. List the equipment, list the systems. As detailed as required, and perhaps some lists for weekly checks and some for monthly. Safety and security…lots of hidden and unknown details there. Those need a list too. Generally, we are responsible for a quality picture with quality sound and a safe and comfortable experience. But there is so much nuance in that simple sentence. How do we find the nuance? Find out what an expert do that seems so natural that you don’t write it down when you are watching them? Describe each process generally, then write down each detail that is done to keep the equipment at top performance. Then, write out a procedure so a person knows what to do to check that each thing from Step 1 is being done. Some things may need to be done everyday, like security checks. Some things might only need to be done every once in a while. So, this is it – we have done it. 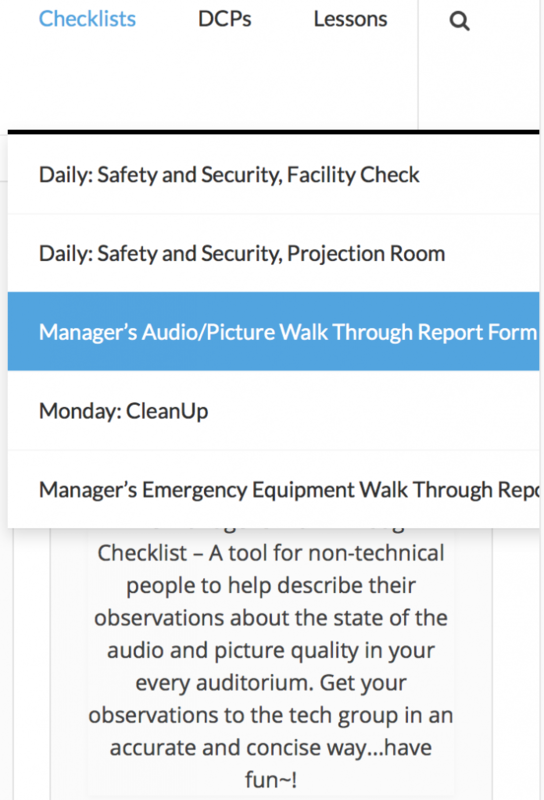 The Checklists that automate quality control. Your Eyes. Your Ears. Your ability to communicate and learn, and observe, and communicate even better! Obviously a bigger topic than the simple question. Let’s do this thing.